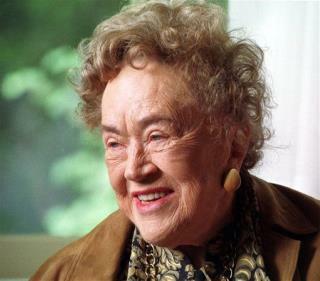 (Newser) – Julia Child would have turned 100 tomorrow, and New York Times food writer Julia Moskin pays her respects. "It was Child—not single-handedly, but close—who started the public conversation about cooking in America that has shaped our cuisine and culture ever since," she writes. When Child's Mastering the Art of French Cooking came out in 1961, it would have been smart to bet against it. In fact, the whole idea of home cooking was starting to seem antiquated just then. The photograph has always been there. Mom has never commented much on it, just saying it was someone she knew during WWII. A couple of years ago she confessed that she and Julia had worked, different areas, for the O.S.S. during that war. Wow. I look at my mother in a whole lot different light now. Wow. I love the fact Julia would remind her readers that the Bible details seven different feasts - so, it's okay to occasionally pig out! Righteous, Sister!